We’ve come a long way since the days of filling out every form by hand. Sure, we still have to manually fill out 193 pages of medical information in doctor’s offices (“Has your first cousin ever had a strange rash?”), but for the most part, we’ve moved to digital forms. This is, as most things are, a blessing and a curse. It’s a blessing because it’s much faster and easier to complete forms. It’s a curse because there are dozens of form builders out there and it can be tough to choose the right one. To help you choose wisely, we’re going to focus on and compare Paperform against two popular form builders. In addition to our own Paperform, two that stand out among the form building throng are SurveyMonkey and Typeform. SurveyMonkey is the grizzled veteran who has been around the block a few times and regularly refers to the “good ol’ days.” Typeform is the new kid in the form building world who listens to indie rock and watches obscure foreign films. We created Paperform to fill a unique gap in the market. After using both landing page and form builders for years, we couldn’t find one that fully met our needs. Landing pages are only designed to do a single thing, such as capture an email address, which makes it difficult if you want to gather any additional information. Form builders allow you capture additional information, but the results are often ugly, don’t match your brand, and are difficult for users to complete. Paperform is designed to bridge the gap between landing page builders and form builders, so you can create either forms or landing pages, or roll them into one as a “Landing Form”. 1. Create pages and forms the same way you do documents. In order to make creating quick and easy, the editor functions similarly to a document editor. You simply add text, questions and logic, payment fields, media, and just about anything else wherever you want on the page. In other words, you literally type directly onto the page, rather than laboriously entering elements like in most landing page and form builders. 2. Surround forms with engaging brand copy and media. Unlike most form builders, which simply spit out a set of questions, Paperform allows you to create forms that integrate your branding in a variety of ways. You can include videos, photos, brand colors, persuasive copy, etc. This can be particularly useful for things like lead generation, where copywriting matters just as much as the form itself. 3. Include forms as part of a larger page. Paperform certainly allows you to create isolated questions across multiple pages, but you can also create forms that are part of a larger canvas which can also include media, embed with HTML, style for days, etc. The goal is to give you maximum flexibility in terms of how you want to lay out your pages. This allows you to create much more engaging forms, which can lead to much higher completion rates. Bottom Line: Paperform is designed for easily creating beautiful “Landing Forms” that bridge the frustrating gap between landing pages and forms. Typeform realized that most forms are more boring than a filling out tax forms and usually a pain to complete. Their forms, on the other hand, flow smoothly from one question to the next and allow the questions to be conversational and easy to complete. Instead of filling out a stale form, Typeform wants you to feel like you’re having an engaging conversation. 1. A focus on one question at a time. Unlike most forms, where it can be difficult to figure out what goes where, Typeform focuses on a having the user fill out one question at a time. This can make certain types of forms feels less overwhelming and makes it easy for users to complete them. 2. Effective at lead generation. Typeform, more than most form builders, can work well for lead generation. They make it easy to create quizzes, personal surveys, etc., all of which can be used to generate qualified leads. 3. A focus on short and punchy forms. Typeform knows that the longer the form, the higher the drop off rate. To counter this, they focus on creating short, punchy forms and surveys that are usually between 7-9 questions long. This in turn can increase completion rates. Bottom Line: Typeform’s focus on having users complete one question a time tends to increase completion rates for shorter forms, and also makes it easy to use for lead generation. SurveyMonkey has been around for a long time, and is a robust, full-featured form builder. To put it simply, they focus heavily on allowing you to create surveys in which you can capture a large variety of data and then analyze that data on the back end. 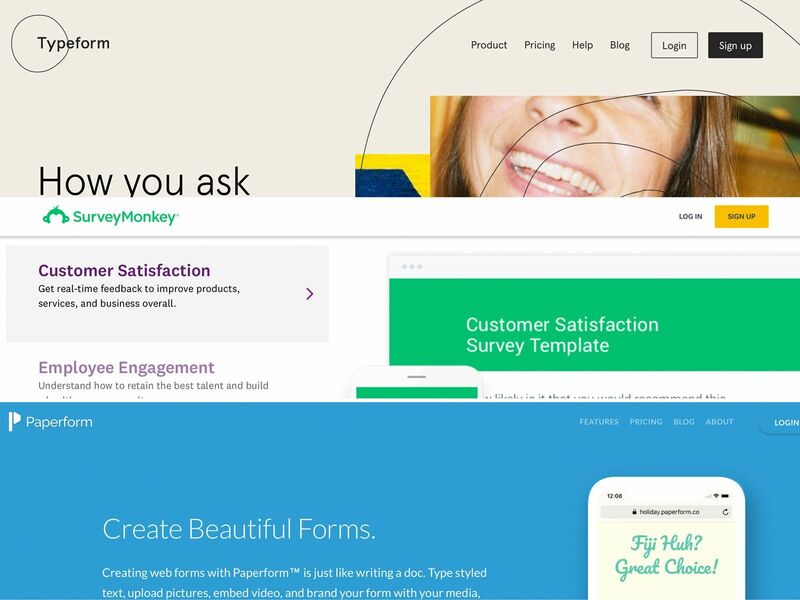 SurveyMonkey has a somewhat limited scope in that they’re all about allowing you to create awesome surveys, and they have dozens of pre-made templates to make it easier. They don’t have a strong focus on aesthetics, although you can customize some elements to match company branding. The absence of aesthetic focus cuts out time spent on styling. SurveyMonkey also has a strong focus on back-end data analysis. Unlike Typeform, which emphasizes ease of use, lead generation, and completion rates, SurveyMonkey emphasizes collecting a variety of data points, like Net Promoter Score, customer satisfaction scores, opinion polls, and market research. After this data is collected, it can then be sliced, diced, and analyzed on the back end. SurveyMonkey makes it easy to natively connect your email client (MailChimp, ActiveCampaign, etc.). This allows you to automatically and seamlessly import email addresses from the surveys directly into your email client, rather than having to export and then upload them. Bottom Line: SurveyMonkey has a large number of features specific to creating surveys, which in turn makes it easier to focus on collecting and analyzing data. Now that you have a solid overview of Typeform, SurveyMonkey, and Paperform, let’s compare specific features of each one. In most cases, ease of use will be a critical factor when deciding between survey and form creation platforms. Unless you’re creating a massive, complicated form that will be used for scientific purposes, you probably want to be able to create surveys and forms relatively quickly. Even then, saving time is probably even more appealing to you. Here’s how the three platforms break down in terms of ease of use. When it comes to overall ease of use, Paperform is breath of fresh air. The focus on allowing you to create forms and pages within a “document builder” of sorts, makes the learning curve extremely low. Additionally, matching your company branding is extremely easy since you can surround your forms with a variety of additional media. Typeform is also very easy to use. However, their focus is narrower. They hone in specifically on data collection in a conversational way, which makes it extremely easy to create text-based forms, as well as insert logic jumps. But they’re limited when it comes to overall design, making it much more challenging to match the forms to company branding, and limiting the types of form that you can create. SurveyMonkey has the steepest learning curve. This is primarily due to a UI that’s not ideal for handling a lots of features. They also don’t have a strong focus on aesthetic appeal, which means it’s more difficult to create attractive, user-friendly surveys. What SurveyMonkey has in power, they give up in terms of ease of use. When it comes to designing your forms, you ideally want to match your overall branding scheme, including colors, photos, copy, etc. All three platforms offer some amount of form customization, with some focusing significantly more on it. Here’s how the three platforms break down in terms of form design. As noted above, Paperform has a strong focus on allowing you to easily create beautiful, branded forms. Whether it’s adding surrounding copy, inserting media, or matching a color palette, refining typography or UI elements, or even changing the entire language of the respondent’s UI. Paperform makes it simple. Typeform also focuses on attractive design, but in a limited way. Their forms flow smoothly from one question to the next, which is certainly aesthetically pleasing to the user. Their focus on conversational forms also appeals to users, who are usually greeted with stiff, corporate forms. SurveyMonkey has a number of design options, but it’s not their primary focus. They’re all about letting you create powerful forms which can collect and process data. Again, it’s the tradeoff between ease and power. SurveyMonkey focuses on the former. When it comes to comparing features, all three of these options have most of the same bells and whistles. There are a few unique things that stand out for each one. but probably the biggest differentiator is the features/options that you get at different price points. You’ll want to pay close attention to what’s included at each pricing tier. Here’s how each platform breaks down in terms of features. Paperform offers all of the same features that you would expect in any kind of advanced form/landing page builder. But it also has a couple of other stand-out features that make it more flexible and more UX-focused. The Doc-style builder is unique and feels simpler and more intuitive than other form or landing page products. But it also offers a rich set of embed and design options, allowing you to build an entirely custom page with spot-on branding, multimedia content, and just about anything else within the flow of your page/form. There’s also native integration with Braintree, PayPal, and Stripe--so taking payments is simple and painless. In terms of pricing, Paperform offers a free 14-day trial on all tiers. The expensive plan, for $15/mo, has a feature set that generally matches competitors higher tiered plans and supports unlimited forms with up to 1,000 responses per month (more bang for your buck). Typeform is probably best known for their “one question at a time” style. This conversation form can be great in many cases, but it’s not entirely unique to Typeform. Paperform and SurveyMonkey can also create paginated forms with one question at a time. What sets Typeform apart is really their unique spin on the experience, making it feel more like a command prompt than an actual survey or form. Typeform does offer a free tier, but it’s pretty limited. Only 10 questions are allowed and only 100 responses per month. Its paid tier, at $30/mo, has pretty much the same bells and whistles of Paperforms’ $15/mo plan. With the most robust feature set out of the three, SurveyMonkey--and its adjacent products--can pretty much do anything you could ever want when it comes to building a form or survey. As was stated earlier, the major drawback here is that the extra complexity can lead to a steep learning curve. You may feel like you’re learning to fly a space shuttle more than building a simple form. Given its use by researchers and academics, SM also has some extra reporting and exporting features that may be helpful, like SPSS support. Pricing for SurveyMonkey closely matches Typeform, with a $32/mo plan (billed annually) giving you almost all available options, including unlimited surveys, questions, and responses. They also offer a free tier, but it limits you to 10 questions and 100 total responses over the life of a single survey. Your choice will depend heavily on what sorts of forms you want to create. Each form builder has its own specialty. Paperform is all about ease-of-use, beautiful design, and the flexibility to create a large variety of forms. Typeform has honed in on creating conversational forms, which work well for specific use cases that have a simple flow; quick-and-easy forms to create and complete, but without the same robust features as the other options. SurveyMonkey has every bell or whistle you could possibly think of when it comes to creating surveys and polls. It does lack functionality for other use cases (lead generation, event registration, landing pages, ecommerce, etc.) And, overall, it’s a bit technically heavy. SurveyMonkey has a steeper learning curve and gives up some design options for the sake of more complex technology. Give Paperform a try. It’s free for 14 days--no credit card required!